Adjustment of overlapping is possible by adjusting linear speed of conveyor- from control panel. Stretch Film is Cheaper Then other packing material. At Starting Point & ending Point – No of Wrap can be adjusted by from control panel. 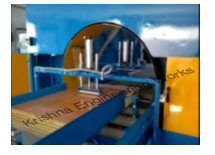 Product Holding : Pneumatically Operated Roller Frame at both side.